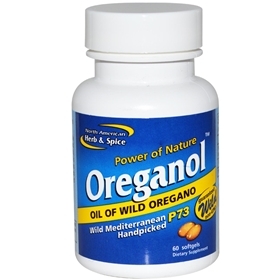 Oreganol P73 gelcaps are the true wild oregano P73 in an easy-to-take gelcap. Oreganol P73 gelcaps are a blend of edible species of wild oregano grown on natural, mineral-rich soil. North American Herb & Spice was the first company to introduce edible oil of oregano to the North American market. We are the oregano experts! This is the result of extensive research and the personal experiences of the company’s founders. To be edible, this essential oil must be made only from wild, mountain-grown Mediterranean oregano, free of all chemicals and pesticides. It also must be emulsified in carrier oil such as extra virgin olive oil, which we use in our oil of oregano. The only oregano we use is the real, 100%-wild Mediterranean oregano, guaranteed to be handpicked in pristine and untarnished remote mountains. A conservation program was implemented to limit excessive picking, which preserves and protects the plants and land. It is the chemical profile that is critical. Oreganol has the ideal profile, which is P73. Oreganol P73 is a specific blend of several high-grade medicinal wild oreganos. This P73 oregano has a high percentage of calcium, magnesium, and zinc, which are absorbed from the mineral-rich soil that it grows in. Take one or more gelcaps as needed with or without meals.